Kyr, now a Philip H. Knight Professor of composition and theory, believes the future of contemporary music is in cocreation, not competition. To that end, he spearheaded a work—a theme and variations on the Ode to Joy from Beethoven’s Ninth Symphony—that was composed by five teenage composers under his mentorship. The Eugene Symphony received a National Endowment of the Arts grant to fund the unique project, and the finished work, “Ode to the Future,” will premier at the Hult Center for the Performing Arts on November 17. “Rob has thrown himself into this project with total abandon,” says symphony executive director Scott Freck. None of the five teens had ever composed a single note for a professional orchestra, but the project enabled them to work closely with one of the country’s most prolific composers and pedagogues. This year alone, Kyr produced a piano concerto for the Eugene Symphony, among other works, and garnered an Arts and Letters Award from the American Academy of Arts and Letters. 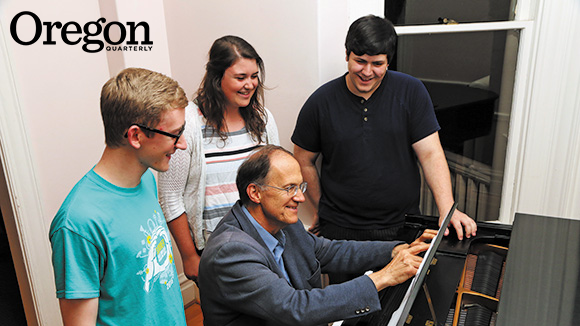 He leaps between teaching, artistic residencies, and composing, never seeming to slow down. Kyr says many of today’s classical composers show more eclectic influences than the specialized music students of earlier decades. Indeed, his young students in “Ode to the Future” came from across Oregon and all over the creative map. Cayla Bleoaja is a 16-year-old first-generation college student from North Bend who plays big-stage piano concerts and records Christian teen pop albums with her sister, Ashley. Joseph Miletta, a freshman at Chemeketa Community College in Salem, started and managed his own string quartet while still in high school. Marissa Lane-Massee, Class of ’20, plays harp, bassoon, and now, with the Oregon Marching Band, sousaphone. Saxophonist Wesley Coleman, who likes jazz and wants to score movies and games, is a junior at Thurston High School in Springfield. Violinist Katie Palka, 15, is the youngest—she’s homeschooled in Beaverton. Kyr compressed a year’s worth of instruction on harmony, counterpoint, and orchestration into about six months. To start, the students each wrote five variations as “short scores” playable on piano. Select variations were organized into one eight- to nine-minute piece, with Kyr making sure each student’s work had equal time. He mentored the young composers as they orchestrated their variations to be played by many instruments, not just one. “Dr. Kyr would guide me along what kind of sound I wanted and what instruments would be good for that,” says Coleman. Graduate teaching fellows in the composition program at the UO School of Music and Dance worked with them to properly notate each score and to extract the parts from it, so the orchestra could perform the work.